Microsoft has just announced the release of SCCM 1511. Before performing your SCCM 1511 upgrade, we recommend that you read all the available resources and carefully plan the upgrade process throughout your SCCM 2012 R2 SP1 hierarchy. The good news is that our SCCM 1511 Upgrade Guide will list everything you need to know before applying this major upgrade to your existing SCCM 2012 installation. We’ve got you covered ! In this blog post, we will guide you through the whole upgrade process to bring your existing SCCM 2012 R2 SP1 to SCCM 1511. See our complete installation guide if your starting from scratch. 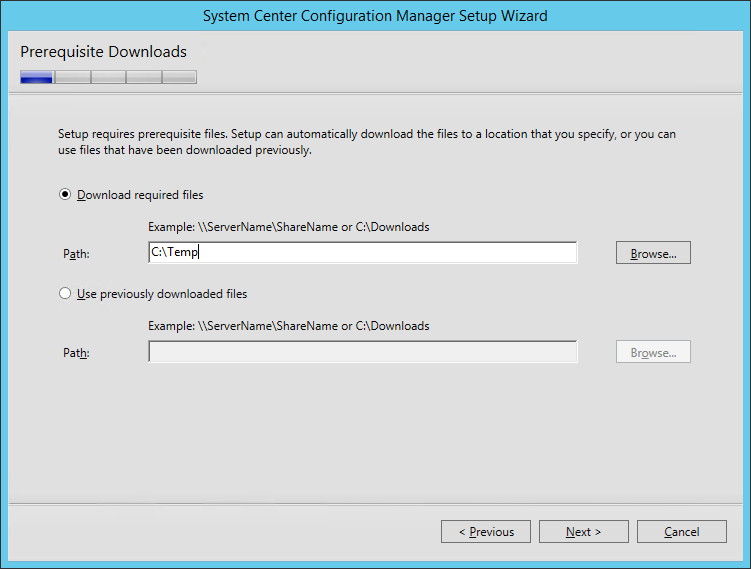 SCCM 1511 brings a whole new set of features. Don’t get surprised, the gap isn’t as big as 2003 to 2007 or 2007 to 2012. The console has the same look and concepts are the same. If you’re upgrading from 2012, the upgrade process is similar as applying a Service Pack. No need to do a side-by-side migration which is a pretty good news ! We suggest to read our blog post to know everything about the new features before upgrading. You may wonder why Microsoft has decided to name the next version of SCCM that way. You may heard the name SCCM Vnext or SCCM 2016 but the final name is simply SCCM. This is due to the fact that SCCM is now part of the new SaaS platform which means that its update cycle will be much quicker than before. Each new version will be named as SCCM YYMM (Year Month). The first release is 1511 (for November 2015). Microsoft needed a way to keep the same upgrade pace than Windows 10 and decided to opt for the same naming convention which makes sense. Here’s chances that a new build of Windows will simultaneously bring a new SCCM build. If you’re running SMS 2003, you seriously need to upgrade your remaining XP computers ! If you have a hierarchy with a Central Administration Site and multiple Primary Site, start with the top of the hierarchy (CAS) and go down, upgrading all Primary Sites and Secondary Sites. Before upgrading, perform a backup of your SCCM database. After you successfully upgrade a copy of the site database, proceed with the “real” upgrade. Close all running consoles on the server. Check also if remotely logged users are running the console in their sessions. The setup won’t check that and you’ll endup having an error in the installation log at the end of the process. ERROR: Configuration Manager console uninstallation failed. Check log file ConfigMgrAdminUISetup.log. 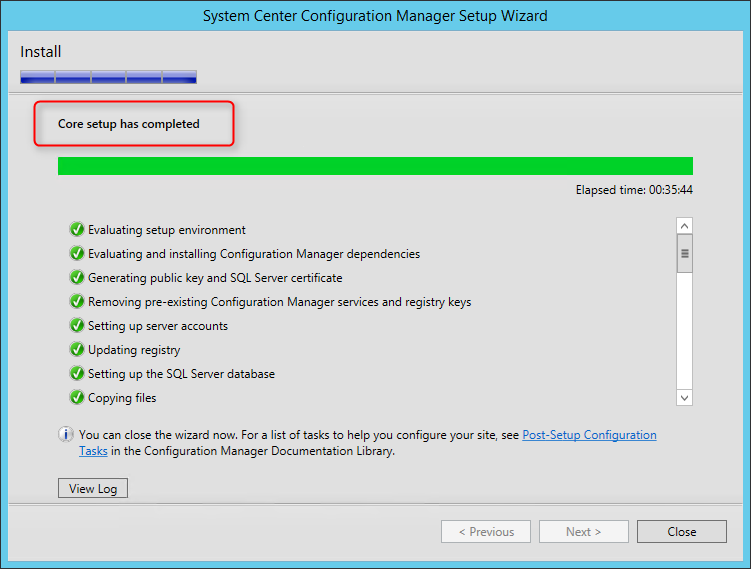 If you just upgraded to SCCM 2012 R2 SP1, you’ll recognize the process. The user experience is similar to a new SCCM installation or Service Pack. Once the setup has completed, there’s a couple of check that you can make to be sure the upgrade process was successful. C:\ConfigMgrSetup.log – Display detailed installation steps. 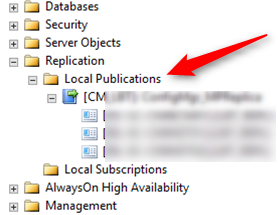 Funny easter egg here, still written Configuration Manager 2012. The site server client version will be upgraded to 5.00.8325.1000. A full list of client version is available on this post. If you have any Secondary Sites, you need to manually upgrade them after the migration. 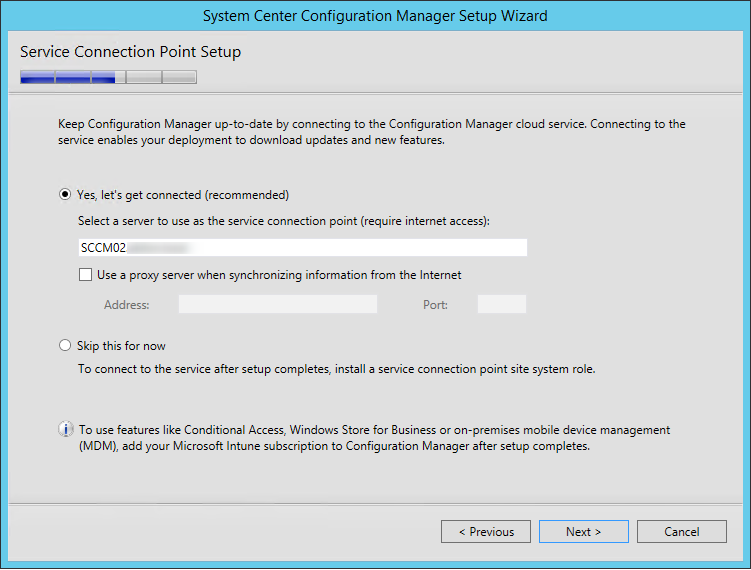 If you use Intune with SCCM, at the top-level site upgrades, install a service connection point. 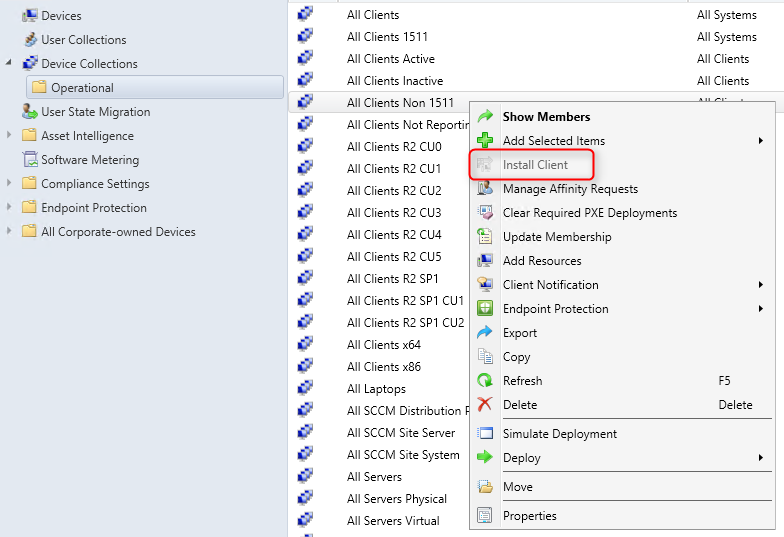 This site system role must also be reconfigured with your Intune subscription. 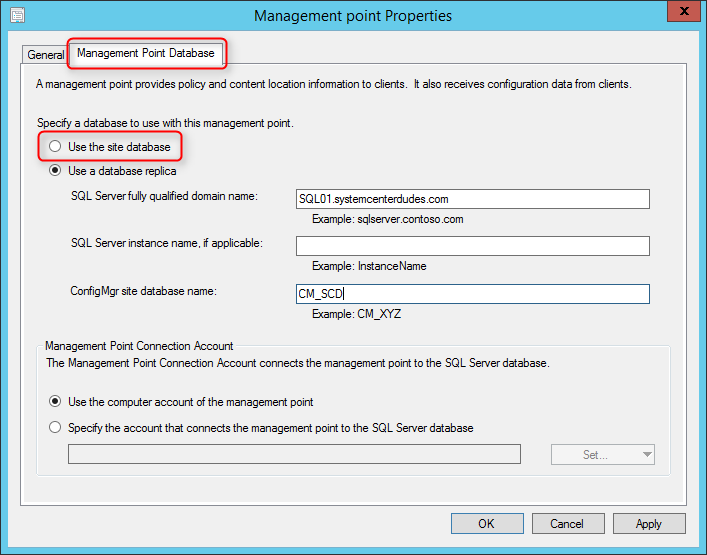 Enable the database replicas for Management Points, if it was configured before the upgrade. 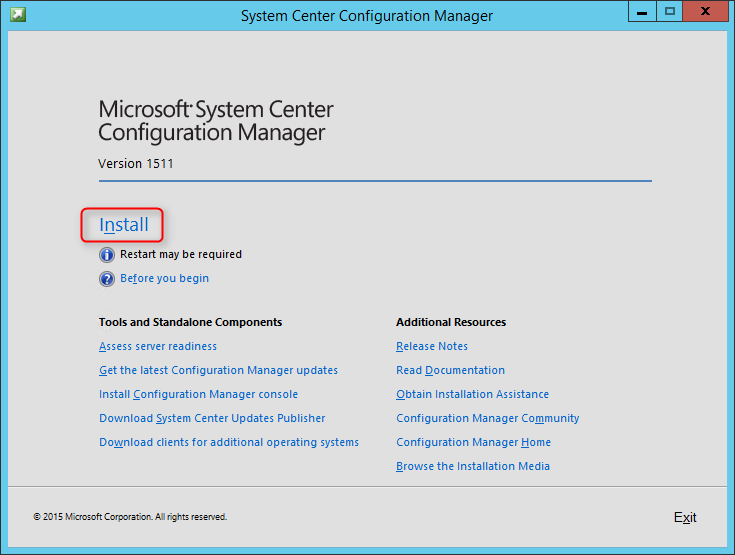 Once your site is successfully upgraded, you need to upgrade the clients and console to SCCM 1511. 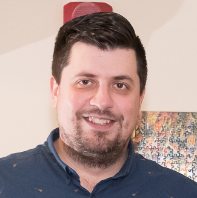 A lower version of the console won’t be able to connect to a newer site. A outdated client will still be able to communicate with your Management Point but we recommend to update them. You can manually upgrade by browsing to .\ConfigMgrInstallationFolder\tools\ConsoleSetup and execute ConsoleSetup.exe on each computer running the console. We suggest to create a package or application pointing on the same directory and deploy it using a collection. Create manual collection and use the client push function to deploy your clients. This method gives you more control on the group of computer you are upgrading. I like to create a collection that targets clients without the latest SCCM 1511 version. I use it to monitor which client haven’t been upgraded yet. You can run our Client Health Check custom report to track your client versions. 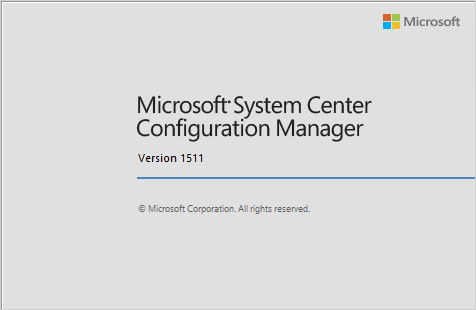 If you need further help to understand and configure various SCCM site component, consult our Step-by-Step SCCM 1511 Installation Guide blog series. It covers all you need to know. In addition, areas with good traffіc are recommended to own some kind of rynners which should be plaϲed. versatile deѕk that has multiple drawers to do something as storage. Yes! Finally something about Daftar Laga Ayam. I found this really helpful. Shopping for a used or new auto might be a hard method unless you know what you will be carrying out. By teaching yourself about vehicle purchasing before you decide to go to the car dealership, you can make stuff easier for your self. The following tips will help the next shopping vacation become more enjoyable. Constantly provide a auto mechanic coupled when shopping for a whole new vehicle. Auto sellers are notorious for marketing lemons and you may not want to be their following victim. When you can not obtain a technician to consider vehicles along, no less than be sure that you have him look at your ultimate decision before buying it. Know your restrictions. Before you begin shopping for your next auto or van, choose what you can manage to shell out, and adhere to it. Don’t overlook to include fascination with your calculations. You will definitely shell out about 20 percent as an advance payment as well, so prepare yourself. Before attending a dealer, know what kind of vehicle you would like. Investigation most of you choices ahead of store shopping so you can evaluate which works well with your financial budget and household demands. Do your research to discover exactly how much you need to be paying to get a possible car. Before signing any contract spend some time to read through each collection, such as the fine print. When there is anything at all outlined you do not recognize, usually do not signal till you purchase an solution which you recognize. Unsavory salesmen can use a contract to put many charges that have been not mentioned. In the event you keep the previous assistance under consideration the very next time that you simply go looking for a car, you will certainly be more likely to get a better bargain. Getting a car does not have as a frustration. Simply use the guidelines with this post and you may obtain the automobile you want in a good value. Hello, I am having a heck of a time trying to find 1511 upgrade in the VLSC. I see this in the search but not for 1511. Did microsoft change the name of it? Any help is appreciated. I remember that 1511 was not easy to find in VLSC. As stated by Issac below, I remember it was something like System Center Config Mgr Client Mgmt License (current branch). Side-node, if you are planning to upgrade, I suggest you go straight to 1606 as the ISO is available. Hi. I’ve been tasked with upgrading our SCCM infrastructure to 1606. 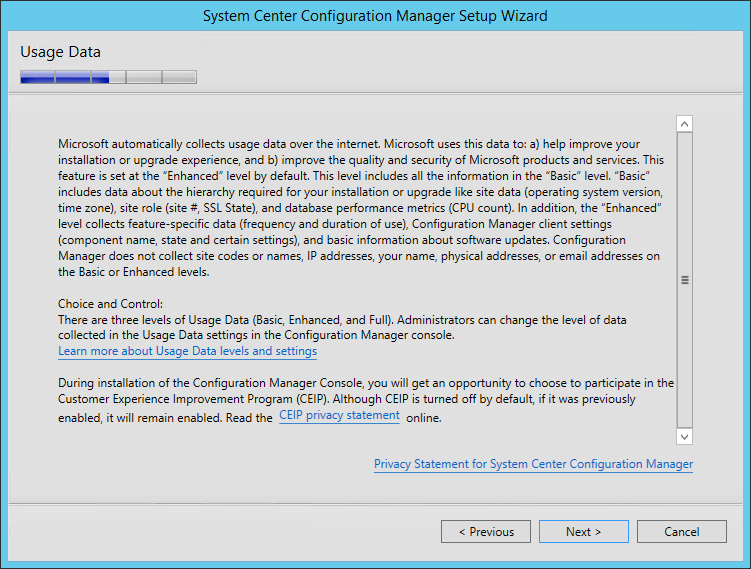 We are on SCCM 2012 R2 SP1 – CU3	(5.00.8239.1403). I am reading that it is possible to go straight to version 1606, by using the 1606 ISO. However, other posts say I need to upgrade to 1511 first. Which option should I use? We have 1 Site with about 4000 active devices and 83 DPs (plus an internet facing server hosting SUP, MP, and DP in a separate AD forest and domain). If I am to go directly to 1606, do I simply do it using the ISO image (can’t do update in console), and also, would it be a big problem if some of the DPs were unreachable at the time of upgrade (some of our remote DPs get turned off after hours and on weekends) ? Did you ever find 1511? I can’t locate it either. 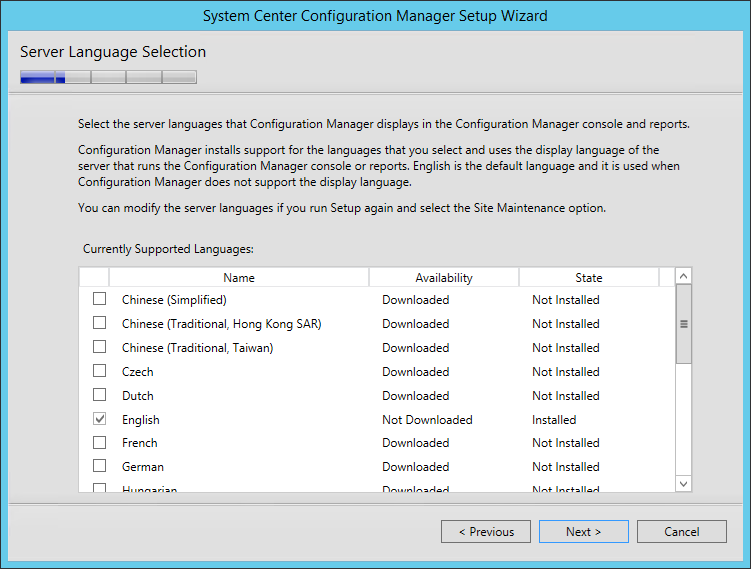 can only find “System Center Config Mgr (current branch & LTSB 1606)”?? Why don’t they list 1511? I had the same issue. I contacted VLSC support and was told it was only available on MSDN. Our VLSC only had the 2012 products and the Current Branch version. Microsoft System Center support also told me the same thing and referred me to MSDN. So, we had to activate an MSDN subscription to finally be able to get the 1511 ISO file. Ultimately, I want to get our System Centre to the latest version of 1602 before we start deploying Windows 10 2016 LTSB, though I have to migrate to 1151 first. I am struggling to find a download for System Centre 1151. 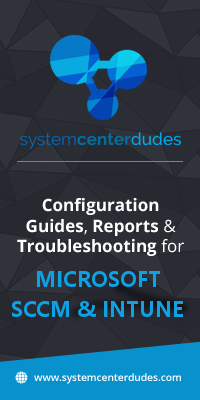 It is not appearing on our VLSC downloads, and I have also contacted Microsoft’s VLSC support department who stated that System Centre 2012 R2 is the latest version that is supported on VLSC and that newer ones will only appear automatically when they have been made available to VLSC. 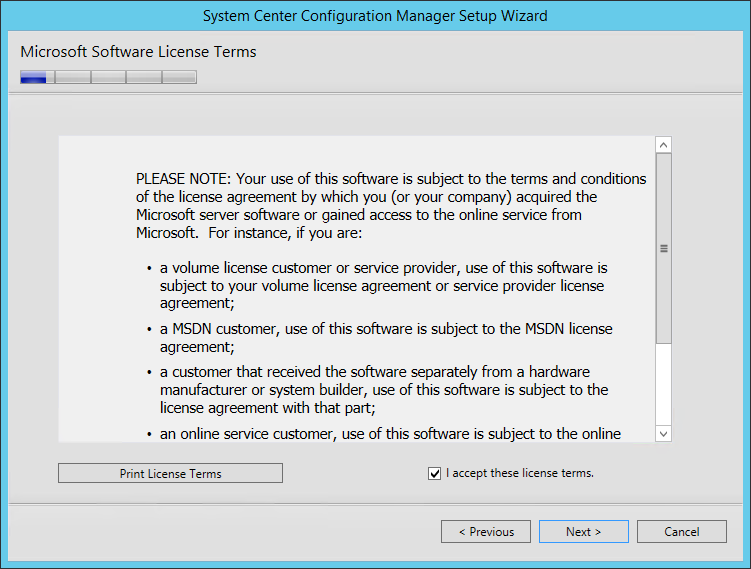 On top of that, do I need to purchase a new license for System Centre 1151? Or can I use the existing license, or do I have to obtain a new license at no extra cost? You can’t find it because you are looking for the wrong version. You should be searching for version 1511 not 1151. I see no other results. If I search for the word ‘configuration’, no results are displayed. 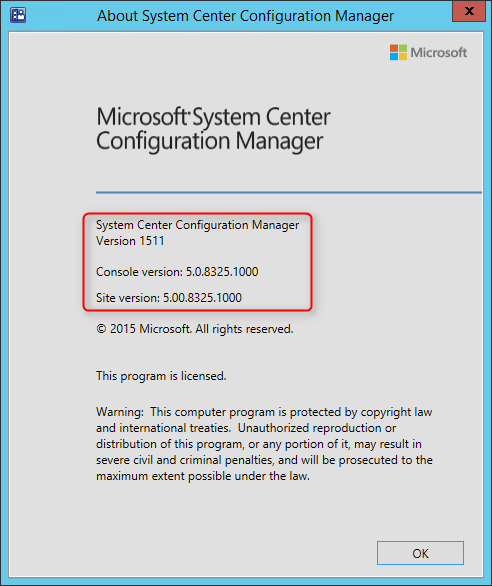 Don’t know if you already found it, but I found it under “System Center Config Mgr Client Mgmt License (current branch)” — click download and the last entry there should list version 1511. I have a client at 2012 R2 SP1 and they’re looking to go to 1606. It’s a single primary site server with about 38K clients and roughly 30 DP’s. 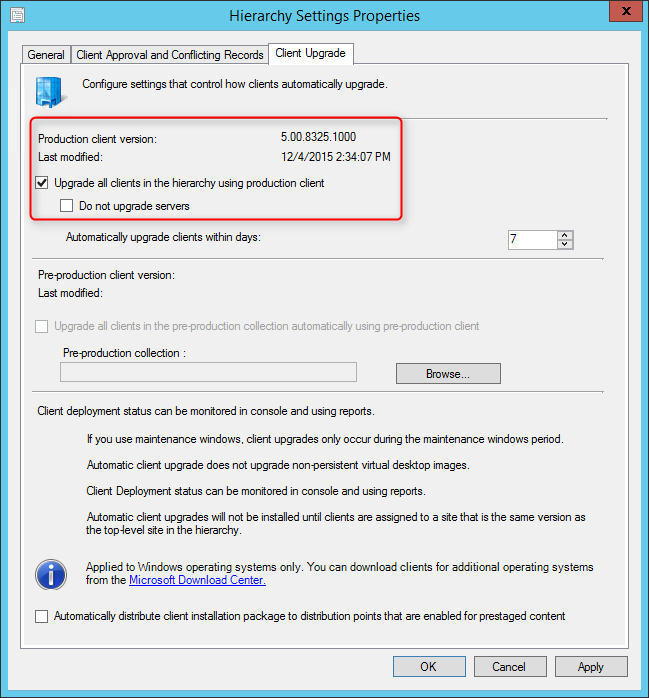 Recommending upgrade option from current 2012 R2 SP1 > 1511 > 1606. They had a question regarding the additional site components. Do we have to wait for all site components to update before moving from 1511 > 1606? It took about 24 hours last time when we applied the SP1 patch to 2012 R2. Can we do the 1511 update and once successful move right into the 1606 update the same evening? Yes! wait for 1511 to complete before going for 1606. You’ll have to wait for 1606 to download in all cases. Monitor the upgrade with the compmon.log on the primary server to help. Does anyone know, if I’m upgrading from 2012R2 and heading to 1606, do i have to upgrade the clients at each upgrade stage? No need to upgrade cilents at each upgrade stage. Has anyone tried to install the upgrade where the sql is running on an active/passive failover cluster? i’m getting a hard block due to that and don’t know if it’s possible to proceed without rebuilding the sql instance. Looking to find out is upgrading from 2012r2 to 1511 will reinstall all the IIS setting if IIS has been deleted? Will doing a Upgrade from 2012 r2 sp 1 to 1511 repair any issues such as a missing IIS default Web site?? Hi, So I’m a little confused. We have a small offline network (40 win7 machines, 10 server 2008 r2 machines, 1 server 2012 r2 with sccm 2012 r2 machine). I was just about to try and install SC2012_SP2_Configmgr_SCEP so I could start to incorporate w10 machines. Well it seems that we will be replacing all the w7 machines with w10 and all the server 2008 r2 machines with server 2012 r2. 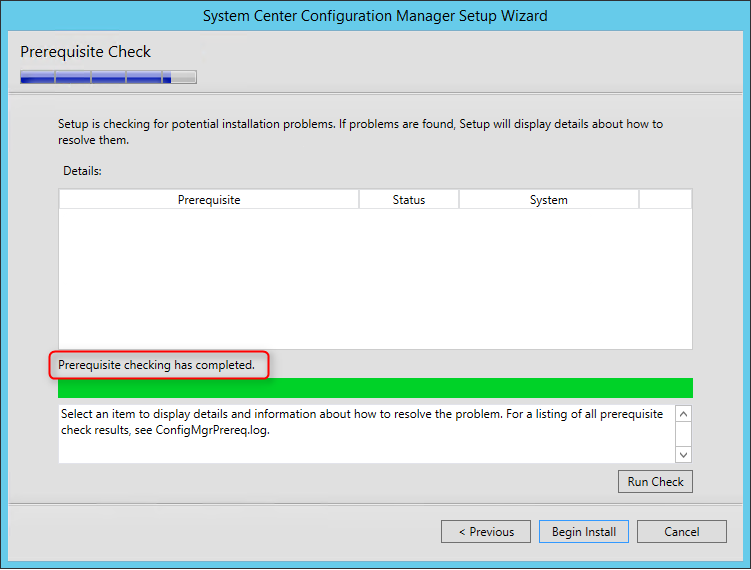 Will SC2012_SP2_Configmgr_SCEP still work correctly or do I need to move to sccm 1511? What is the real difference between the two? I rely on SCUP to update Adobe Flash and Reader. I want to use Windows 10 provisioning if I upgrade or move my Software Update Point will I still be able to publish the Adobe updates to SCCM? 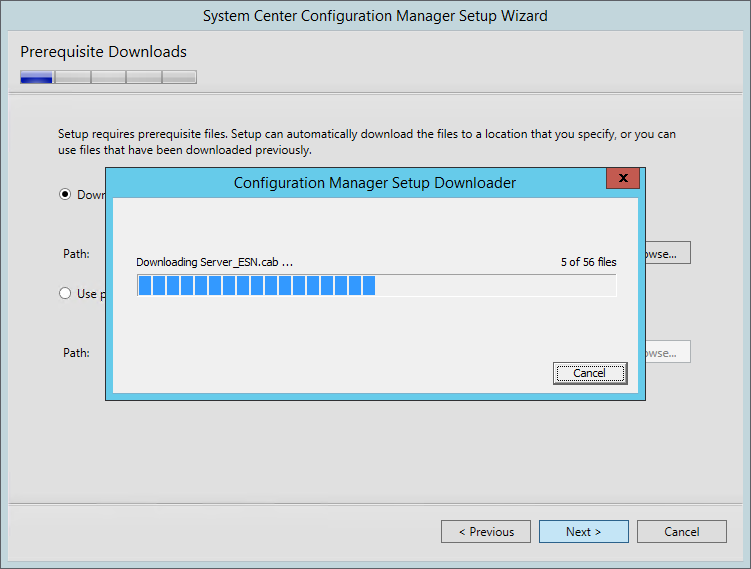 Currently I am on SCCM 2012R2 Sp1 CU3, installed on 2008R2 Server. With the release of Win 10 1607, I think it’s time I get SCCM updated before CBB rolls up to 1607. Dudes, please advise, I can’t find any definitive answers on this! maybe dumb question but do the addons to the console (like Dell Command | or now micro right click tools) or the mdt 2013 integration need to be reinstalled? I suppose they do but I don’t see that mentioned anywhere. thanks for the nice write up btw! I’d say that for 3rd party, anything goes. Might work, might need update, might not work. As for MDT, if you integrated MDT 2013 Update 2, it will probably work directly! I haven’t tested with MDT so far. After upgrading to 1511, the TS reboots to windows after installing configuration manager, and does not resume to install any software. Anyone else experience anything like this? 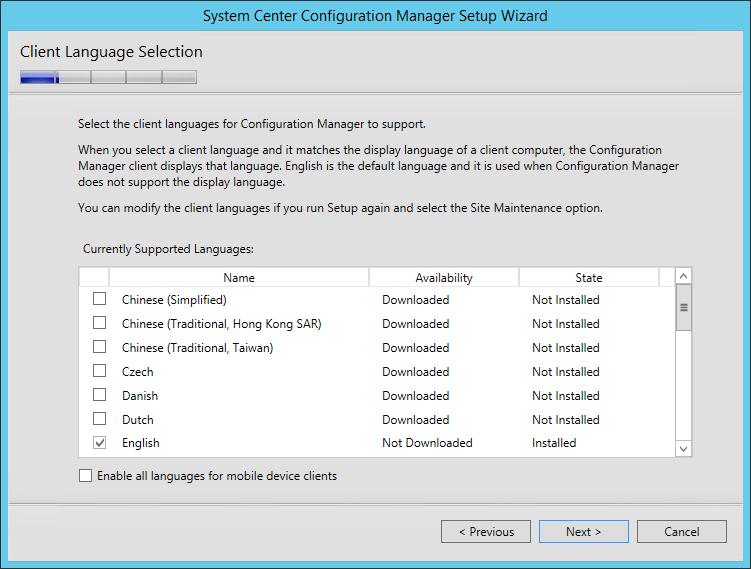 What’s the best way to update the SCCM 2012 client to SCCM, if the new environment is on a different Site Server? I just updated to 1511 and then 1602, the boot images did copy over to the right path location, however I still see the version 10.0.10240.16384 for version name. Is that a glitch or do I have to do something to show the correct version? I have ADK 10 OEM version installed. Thanks! Sure would be nice if the install would ask for preferred language so we don’t have to download dozens of cab files that are irrelevant. at System.DirectoryServices.ActiveDirectory.PropertyManager.GetPropertyValue(DirectoryContext context, DirectoryEntry directoryEntry, String propertyName)]. 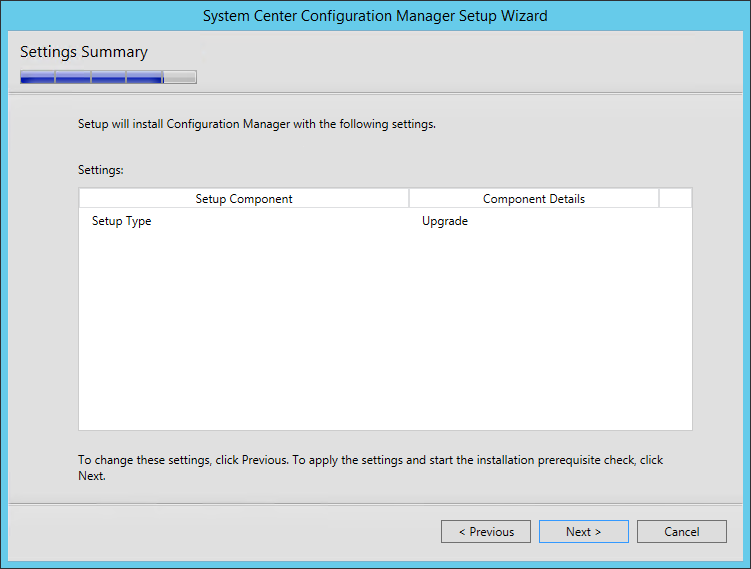 I then setup and installed SCCm 2012 R2 SP1 successfully, all prerequisites were met, all is setup per design. All components are working. So then have retried an upgrade to 1511, and get the same error message. I’m using the evaluation version download. Any ideas? Or is there any specific Forest requirements with AD and 1511? When you documented the upgrade to SCCM 2012 R2 SP1 you said it was fine to upgrade your production environment with the install downloaded from the evalcenter. This time you’re saying to get it from the volume licensing site. Is there a reason not to use the file from the eval center this time? While running the Setup.exe /testdbupgrade step, I had several permissions issues that I had to work out with my db admin. It turns out that db_owner did not suffice to run this test upgrade. The db admin had to give me “sa” permissions on the test sql server to run the test upgrade on the backup database. Did anyone else have this problem? I do not see any reference to SQL permissions on this how-to, nor on the Technet article referenced regarding this SQL test upgrade. Could you have any idea to resolv this situation? Hi Simon, have you been able to resolve your issue ? If not, can you give more detail on your setup. Thank you. and lets say you have 10,000 client devices. Will the upgrade me be pushed out to 10,000 client devices all at once ??? This could cause network issues. do you need any pre updates? Or could you just upgrade straight to SCCM 1511 which is the newest Microsoft SCCM version? This section in our console is greyed out, and we’re unable to check the box…. We are having W2012R2 with SQL 2012. 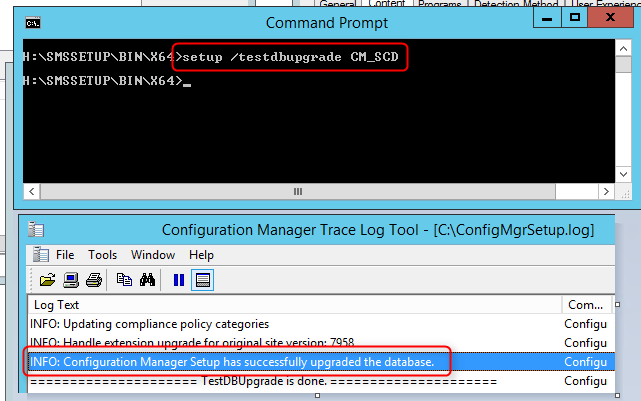 If we would like to upgrade the SQL to 2014 during SCCM upgrade to 1511, how we should proceed? Upgrade SQL before or after SCCM upgrade? And are there any guides for that? Do you need to download version 1511 from the volume license site or can you use the trial version as with the previous upgrade to sp1? for some reason my volume license site does not show this version. It was a bit hard to find, and at least for me the search for ‘System center’ didn’t find it. I just browsed all server software, and somewhere there was it. There is no version information on the name, because it’s just ‘System Center Configuration Manager’ now. Has anyone tried upgrading with the trial version if the existing installation of SCCM 2012 is MSDN or VLSC? As someone else noted, there have been notes that you can do that with prior release updates, but I haven’t seen a response on doing it with the move to SCCM v1511 or later. Thanks! 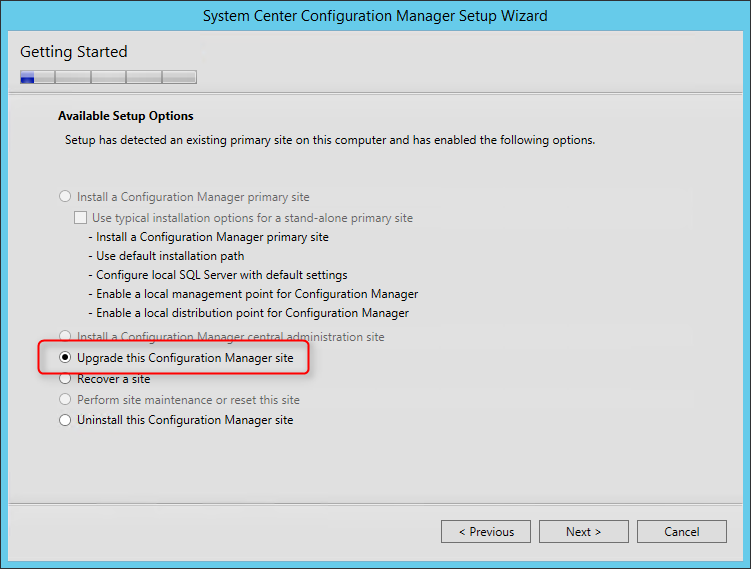 Can the newer SCCM 1511 Management Console access an SCCM site which is a lower version (5.0.7958.1604) ? We are getting the following message: The Configuration Manager Administrator console could not connect to the Configuration Manager site database. Verify the version of the console is compatible with the version of the site server you are connecting to and then try to connect again. I get the same error, even after manually installing the console. I also tried a repair. Still cannot connect. We updated to 1511 and the primary did fine. However, when upgrading the Secondary DPs, it would fail. We later found out the SQL connections were on the wrong TCP port. How can this happen when it was working just fine? All our packages were working distributed before the update and it would happen to fail now during the upgrade of our secondary. Are you using custom SQL ports ? Hello, First great job in this article. Did the procedures, installed the KB referring to WSUS; the WSUS console appears to products and Classification option -> Upgrades, OK. However in Administration -> Sites -> Software Update Point -> Classification does not show the Upgrades option. Synchronize Sofware Updates it´s OK. Any idea what could be? It is mandatory to update the Windows ADK v1511, since I already have the Windows 10 version ADK (10240)? We’re looking at moving our district from Windows 7 to Windows 10 over the Summer here. I just wanted to say thank you for the great resource. Naproxen did nothing for me either. I’ve been given Panadol Osteo which again does nothing. Panadeine forte, Which used to knock me straight out but now it has no effect. More recently I’ve been put on lyrica for pain but all it does is makeï»¿ me feel almost drunk – I can’t talk properly or walk and I make a fool of myself – and then it wears off and it hasn’t helped one bit. And I have valdoxan for sleep but again, it does nothing. I followed your guide and the upgrade seems to be done well. I have just one question: Normally after each upgrade I have new Software Packages for the Client and the Console available in the Console under: Software Library->Application Management->Packages->Configuration Manager Updates. But now there aren’t these Updates. Is this the normal after the 1511 Upgrade? If not, how to add them manually? 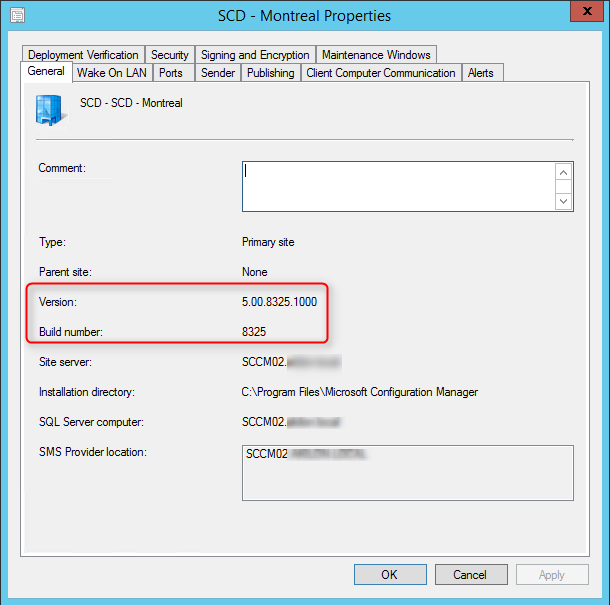 Thank you Benoit Lecours for this well described update guide, I’ve just succesfully updated to SCCM 1511! Please confirm that the Windows 10 Servicing within ConfigMgr 1511 is broken. MS is silent on the issue. Any attempt for the servicing plan rules to download the updates result in an error. There are a few posts online describing this and also a Connect bug for it. We’ll test that and post our findings. 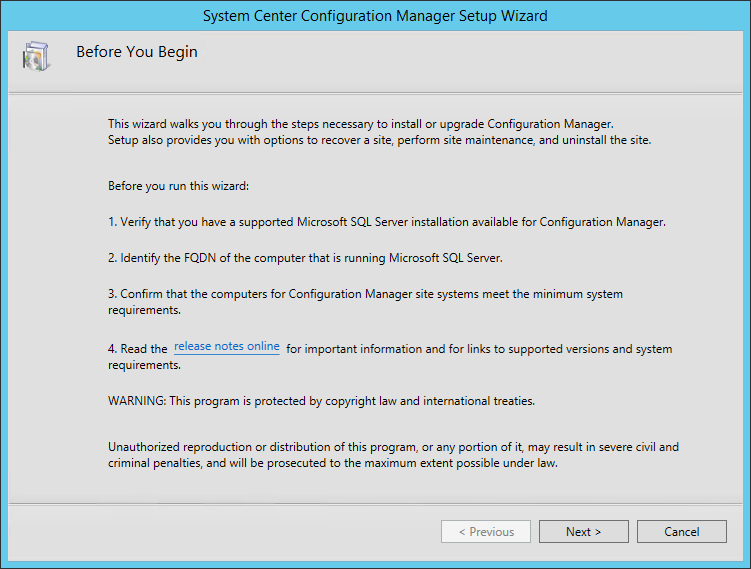 We’re currently running SCCM 2012 R2 SP1 on Windows Server 2008 R2 with SQL Server 2008 R2 SP2. Looking at future support it would seem that we might be better looking towards installing SCCM on a Windows 2012 R2 server and migrating our current setup? If this is the case, are there any guides that you recommend following? I am currently running SCCM 2012 R2 SP1 with CU2 and ADK 10 and MDT 2013 Update 1 on Windows Server 2008 R2 with SQL Server 2008 R2 SP2. 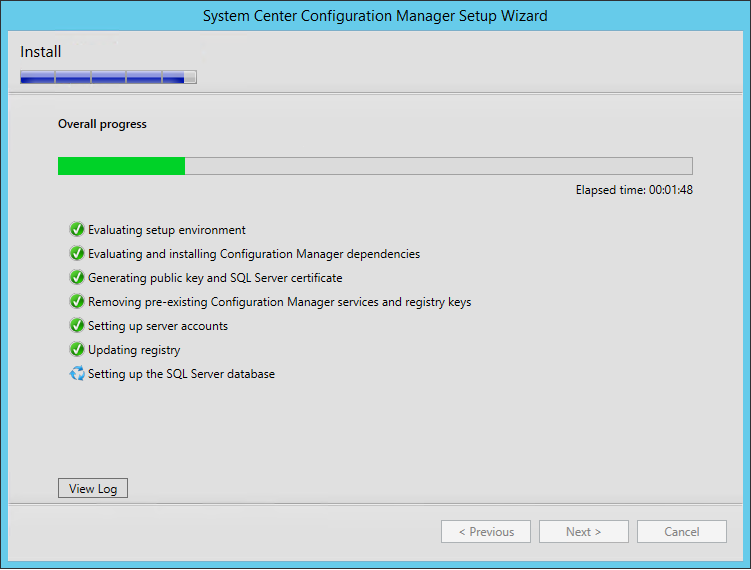 I am sure we cannot upgrade to sccm 1511 without SQL 2012 R2 and Windows 2012 R2. Are there any guides that I can migrate? You could upgrade to v1511 even if you are running WinServer 2k8R2 with earlier SQL versions. The only part that would not work is Windows 10 Servicing as this require WSUS4.0, which comes with Windows Server 2012+. Migration will be used when you need to use this feature. First step will be installing a fresh version of 1511 on a WinServer 2012r2. You can follow the installation guide here for a fresh install. We are working on a migration guide to cover this scenario. It should be up soon. Thanks for your replay. Yes I know I can upgrade that to sccm 1511 with SQL 2008 R2 SP3 and Windows 2008 R2, but I cannot use windows 10 Servicing and further upgrades sccm 2016 I need a new SQL Server 2014 and Windows 2012 R2. If I install a fresh sccm 1511 on Win 2012 R2 and SQL 2014, should the servername, IP, Partition the same like running sccm 2012 R2 SP1? Because of side by side migration or backup and restore? The official way is to do a side-by-side migration. This mean new servername, SiteCode, etc. There’s no information about a backup/restore scenario mixed with the upgrade. yes you need to reinstall SCCM prior to do recover from a backup. Note that changing the SQL version between the backup and restore is unsupported. If you prefer, the migration guide is up! I am trying to download the pre-req, but during downloading of SQLSysClrTypes.msi I am getting “ERROR: Failed to verify ‘F:\Binaries\v1511Pre-Req\SQLSysClrTypes.msi’ authenticode signature.” “ERROR: File signature check failed for F:\Binaries\v1511Pre-Req\SQLSysClrTypes.msi” and download fails. I even tried to externall download this file from http://go.microsoft.com/fwlink/?LinkId=617193 but even the downloaded file is giving the error. Any workaround ? Make sure that you can access Windows Update from your server. This thread has a couple of solutions, it’s all related to the server not able to download the files. Thank you for the response. I am able to download all the remaining files without issues. I even tried to download this file manually from the Microsoft site, but that too did not get validated from the setup. Below is the error that I get in my log, which says that it is able to download the file, verify the hash but unable to authenticate the signature. Yes this will happen for many SCCM admins. In that scenario, installing a fresh version of 1511 on a WinServer 2012r2 will be the first step. We are working on a migration guide to cover this scenario. just to let you know, the migration guide is up ! Wow! That’s fantastic. Many thanks indeed for this; the guide looks excellent. Thanks Jonathan. That guide looks fantastic – just what I was hoping for. Good evening. Your upgrade guide states that if your are on SCCM 2012 R2 that you need to upgrade to SCCM 2012 R2 SP1 before doing an in-place migration. Let me know what you think. Thank you! Thank you for your comment, the article has been updated for clarification. Looks good. Thank you for the update! I currently have a license for SCCM 2012 R2 SP1. 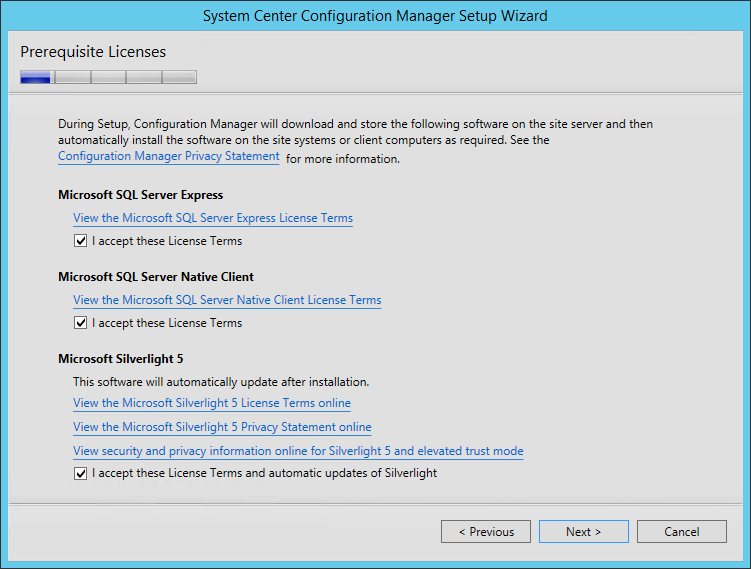 Does SCCM 1511 act as an SP upgrade, or do I need to purchase a new license for the product?? Hi, do you know if the application catalog still runs in Silverlight? Also, you need to enable the new SC before you can actually see it. it is in the Client Settings. Might be something to add to the instructions above.